The Whiteley Clinic and Absolute Aesthetics newsletter for Spring 2019 is now out. In it, we cover a host of new services and information about veins and aesthetics. 20 Year Anniversary of Endovenous Surgery for Varicose Veins. 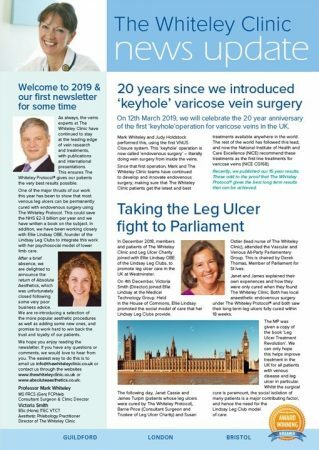 On 12th March 1999, Mark Whiteley and Judy Holdstock performed the first “keyhole” operation for varicose veins in the UK. This has now become the recommended way to treat varicose veins. Our developments over the 20 years have allowed us to use only the best techniques for our patients. Taking the Leg Ulcer Fight to Parliament. Working closely with Ellie Lindsay OBE, we have been to Parliament to present the case for curing leg ulcers. Ellie founded the Lindsay Leg Clubs. The Whiteley Clinic has shown we can cure most leg ulcers. The country would save £2-3 billion on wound dressings if leg ulcers were treated by The Whiteley Protocol. Being leaders in the treatment of Pelvic Congestion Syndrome, Mark Whiteley of The Whiteley Clinic sits on the PCS International Committee. This committee is writing the UIP international guidelines for pelvic congestion syndrome (PCS). Best Vein Surgeon in UK – Tatler 2018. For the 10th year in a row, Mark Whiteley was featured in Tatler under “Best Vein Surgeons in the UK”. Haemorrhoids Treatment under Local Anaesthetic. The new Rafaelo treatment is now available in London and Guildford at The Whiteley Clinic. It is a true “walk-in, walk-out” procedure with minimal discomfort. Skin “Lumps and Bumps” Removal and Mole Check. Dr Prasanna Lingham is running a skin “lumps and bumps” removal service at Absolute Aesthetics in Guildford. He also checks moles and is able to remove any that need it. New Book on Curing Leg Ulcers. 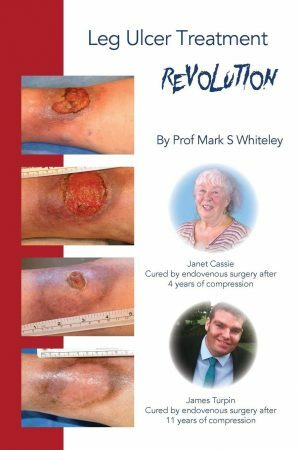 “Leg Ulcer Treatment Revolution” by Mark Whiteley explains how leg ulcers can be cured with local anaesthetic procedures. Most patients can throw compression dressings away. Aimed at patients, doctors and nurses, it is available on Amazon. Removing Brown Stains on Legs – New Treatment. Many people with vein disease or leg ulcers end up with brown stains called haemosiderin. Vicki Smith has introduced a new combination laser treatment that effectively removes these brown stains (haemosiderin). Removing veins of Face, Temple and Forehead. Many patients hate visible veins on or around their face. Mark Whiteley and Vicki Smith have been combining the skills of The Whiteley Clinic and Absolute Aesthetics to find new treatments for almost all of these veins. MiraDry® – Cures Armpit Sweating, Odour and Removes Hair. MiraDry® is the revolutionary treatment of armpit sweating, usually curing patients in two or three sessions. Recent research suggests it also reduces armpit odour (BO) and can remove underarm hair. This is especially useful for blonde, red or grey hair which cannot be treated by laser hair removal. Vein Screening at Polished in Godalming. Lockonego – Celebrity Hairdressers Offer. Elizabeth Smith is providing general podiatry services at the clinic in Guildford. In particular, she removes verrucas using the latest laser and plasma techniques. The contents of this site are for informational purposes only and are meant to be discussed with your doctor or other qualified health care professional before being acted on. Always seek the advice of a doctor or other licensed health care professional regarding any questions you have about your medical condition(s) and treatment(s). This site and the information provided is not a substitute for medical advice.